When cooking lamb I usually go for Indian style with fragrant, hot spices and cooling raita. For this though I went for a very simple and zesty Greek version served with haloumi and tzatsiki. 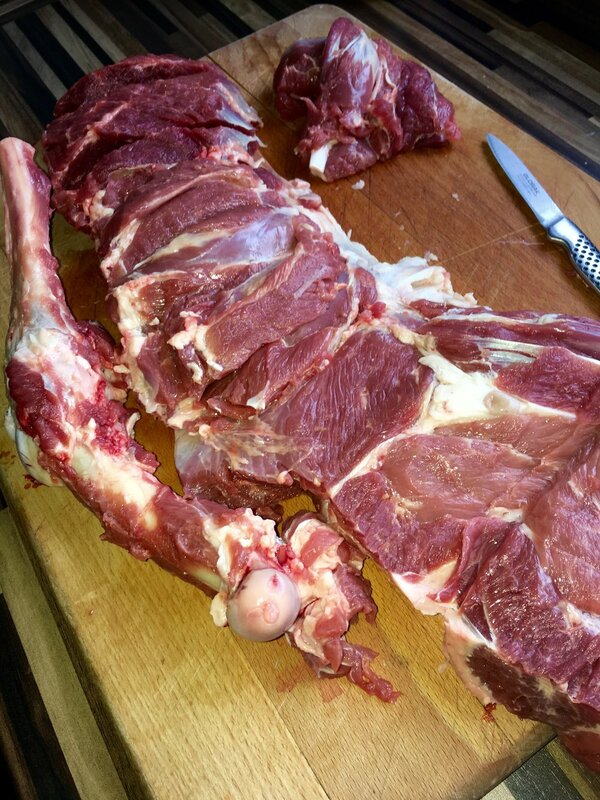 Cooking any joint of meat with the bone in usually produces a better tasting more succulent result but removing the bone has its advantages. Firstly it's easier to grill and is quicker but more importantly it provides more service area for the marinade to penetrate and to crisp up on the grill. The marinade has few ingredients but they all pack a punch and I haven't skimped on the quantitys either. If you are feeling adventurous (and you should) remove the bone from the leg. There are numerous YouTube videos which talk you through this but if you don't feel like you could handle it just ask your butcher. As long as you take your time and have sharp knife it's relatively simple so give it a go. You are aiming for uniform thickness along the meat to ensure it cooks evenly. I removed the top half of the shank just so it was tidy and even. Once the bone is removed place in a dish along with the marinade ingredients and if possible refrigerate overnight. After searing put the lamb to the opposite side of the grill from the coals, close the lid and cook for around 20mins. The temp of the BBQ was 200c so if you are using an oven use this as a guide. Remove and rest for 10 mins before carving. I usually serve with a simple vinegar based salad, tzatsiki and flatbreads.